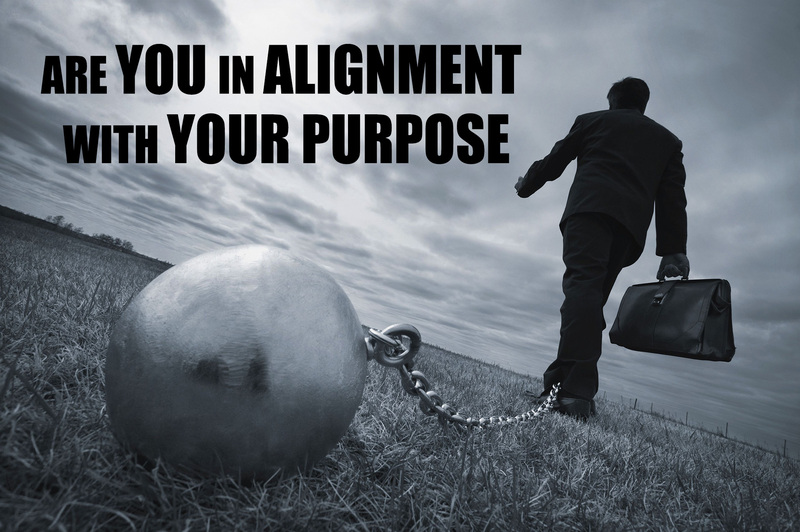 Are YOU in ALIGNMENT with YOUR true PURPOSE? 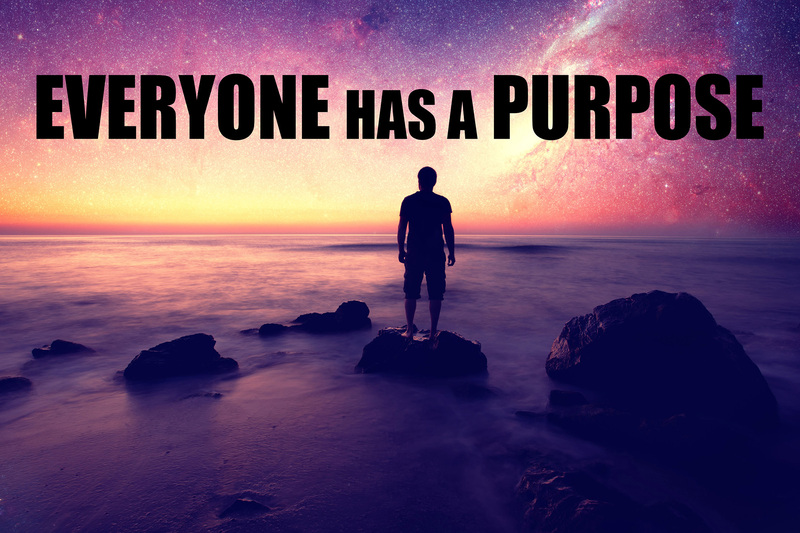 More that 9 out of 10 people die without fulfilling their purpose or even finding it. You might be in the 99 percentile club of the population, who look from outside in rather than from inside out. You have been told that your purpose in life is to fulfill a series of checked boxes, graduate, get a family, get a job and then wait for the retirement check to clear. Stay inside the boxes and die. Sadly that is the life story of most of us on earth. The good news is that you are reading this, meaning that there is something inside of you trying to break you out of the shackles defined by the boxes you have selected to put in front of you. Your all powerful subconscious mind, your higher self, knows your purpose already, but yet you have voluntary been driving your conscious mind without programming it to lead you into your purpose or at least reveal what it is. Then you have been living without letting yourself become the happiest, most loving, most caring, most trusting, most wonderful version of yourself. Comfort is not your purpose, but once you are in the comfort zone it’s hard to step outside again and into your greatness and into alignment with your purpose. Your purpose involves risks and the unknown, therefore you have chosen a career instead of finding your purpose, because it matched the boxes you were told to check, on your so called life path, that the society managed to convinced you that it is your truth, your reality. Are you in the 99 percentile club? There is no shame in it, I was there as well, just a few years ago. Do you not like silence and have you instead selected to thrive of your ego? Have you decide to live your life where the ego calls the shots, instead of calming your mind to the point of going beyond thought? When you calm your mind beyond thought you bathe your consciousness and subconsciousness in the field of endless possibilities and wisdom. You get all the answers you seek, because you are finally listening, once you shut off the clutter of the mind for awhile. TM meditation is one of the meditations that help you bathe in the field of endless possibilities and wisdom, if you want to use other meditation techniques, just keep in mind that not all of them accomplish that, just make sure to research which meditation method will get you beyond thought and into the universe energy field of endless possibilities and pure wisdom. You probably don’t like the dark side of you and you never want to show anyone these dark sides you have. You select to avoid the people that can teach you the most about yourself, because you tell yourself that you simply don’t like them, when in fact, it is something in you that you are seeing when you look at them with dislike. Instead you select comfortable relationships that reinforce your torn, stale image of yourself. Facing your dark side and improving on them, getting past them and turning your weaknesses into your strengths is were you will grow the most. That will support you on your journey to reveal your true purpose as well. You keep creating opposites in your life when you constantly avoid letting yourself feel, I mean deeply feel things. The duality of the mind is rational and thinking yourself into a purposeful life will never work. A big part of living on purpose with a purpose, is learning how to create with your heart, from your heart and staying away from the duality of the mind. When you create white with your mind, you are creating black at the same time. When you create love, you are also creating hate, but when you create from the heart, you are creating in singularity. Meaning that there are no shadows there, you create without an opposite. Why do you think that so many times in your life when you thought you were on a great path to success, when you felt that you had done everything with good intentions, that you manage to self-sabotage your success or an unforeseen event prevented further growth, sickness, accident or anything else that might have seemed like a coincidence? Yes, that’s right, even with all you good intentions created with your mind, you also created the opposite of that, at the same time. Your mind is one of your biggest obstacle, preventing you from living your life on purpose with a purpose. Your whole life you are either moving toward your purpose or away from it, just like energy, it’s always moving, never still. You are pure energy. Energy is growing or shrinking, companies are growing or shrinking, relationships are growing or shrinking and you are either growing or dying, it’s that simple. Your conscious mind, can and needs to be, programmed to control your all powerful subconscious mind, so that life starts to happen for you instead of to you. You must take full responsibility for everything in you life, yes that is right, absolutely everything. Once you do that, you take credit for you wins and losses, and you move on, you keep on learning and growing. Your ego will play a big role in making you feel like a victim. It is so easy to take no responsibility, but once you decide to take full responsibility for everything in your life, that is the day you take control of your life and start moving towards your purpose. Once you start to live you life in alignment with your purpose, you can start to define your success. Your success story is defined by your well defined purpose, backed up with faith, that it is possible to achieve it and you must have the will to step outside your comfort zone and take action.